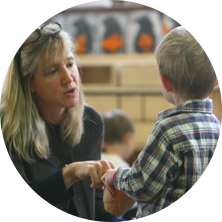 At Chappaqua Friends Nursery School, every child’s growth is recognized as unique, and children develop their own special style at their own pace. We do not look for a standard set of skills to be mastered by a certain age. Rather, we look to nourish and enhance each child’s own complex set of interests, strengths and gifts through our mindful and deliberate curriculum. We are proud of our curriculum. It is dynamic and mindful. We are passionate about investing energy and time in exploring and adopting progressive ideas to provide the finest Early Childhood Program. Our programs remain true to the ideals of progressive education. Our curriculum supports a developmental, child-centered approach that uses a play-based methodology to help children discover the joy of learning while exploring the intersecting worlds of friendship, nature, self-expression and listening. We also engage in ongoing dialogue with our surrounding Elementary School communities to ensure we adopt ideas and practices in key subject areas and social development so that children are best prepared for a successful transition to their kindergarten environment. Our curriculum represents the totality of our students’ experiences. It truly comes to life in activities that integrate studies in language arts, science, early mathematical thinking, nature and friendships–all through thoughtful play. 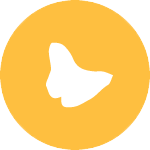 Our dynamic yet predictable framework supports children in feeling safe and secure as they explore new relationships and feelings, new materials and ideas, as it develops a foundation for lifelong learning and friendship. Our aim is to help children develop as whole persons through meaningful conversations, storytelling, productive play, hands-on nature study, big movement and art experiences. 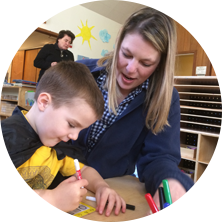 Our purpose is to help prepare these small beings to continue their educational journey to kindergarten and beyond. Language Arts is at the heart of our program. 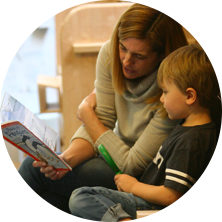 We are a literature rich environment and encourage a love of books, storytelling, music and movement to foster communication, reading, writing, listening, and creative expression. Art is experiential and exploratory. The children are in charge of creation and every creation is different for each child. The differences are visual traces of the choices in color, shape, and form. The feeling, thinking, and talking in the art area are significant – linking the art experience to storytelling, science and math. Our science focus fosters a child’s innate nature to question and learn. We use provoking tools for play and learning to ignite curiosity and empower open-ended investigation. Our math focus is guided by how children build their understanding of mathematical concepts and skills. We integrate fundamental mathematical thinking into the children’s daily activities through our Building Blocks program. Our school provides a natural setting for experiential learning and exploration that will foster a lifetime of awe, wonder and appreciation for our natural world. Learning to be a good friend is at the core of everything we do. Each day children explore creative expression, kindness and respect. We help them navigate friendships, develop empathy, resolve conflict and care for one another. We teach Spanish through song. 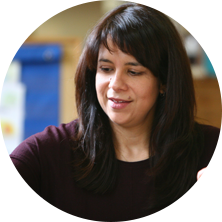 The children hear sounds of another language when their brains are cognitively flexible and there is the potential for cognitive connections. Language is an element of traditions we explore as the children discover their expanding world. Children benefit from movement and music to learn and convey meaning. Through a combination of music, dance, creative movement and yoga, children explore how to translate aspects of their physical expression into verbal expression. Our progressive journey is designed to expand each child’s understanding of the world and themselves. We are committed to helping children discover and develop the skills they need for individual journeys to kindergarten and beyond. We offer early childhood classes for children ages 2 through 5. Our classes are designed to expand a child’s understanding of the world and of themselves in an environment where they feel safe: safe to be both who they are and who they can become. We are fortunate to call the original Chappaqua Friends Meeting House home for over fifty years. 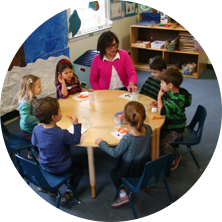 Chappaqua Monthly Meeting began the Nursery School in 1962, to offer the community an excellent early childhood program. The Meeting House, built in 1753, provides an environment rich in history and warmed by friendship, as people have been coming together here and forming community for more than 260 years. 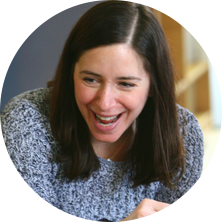 While the Chappaqua Monthly Meeting and Chappaqua Friends Nursery School are actively engaged with nature, we continue to invest to create an educational space where young children flourish socially and in the Arts, Science and Math. Thanks to the generosity of our community, we continue to make improvements to our educational space. Our community’s donations, talent and time have afforded us extraordinary additions such as the dynamic details of our playscape, our birds nest climbing structure and the indoor magnet wall and loose parts project. These enhancements help us continually expand creative play outdoors and in the classrooms. The Chappaqua Friends Meeting House is situated in a beautiful, tranquil wooded area we call the meadow. The meadow allows children to explore and study nature with their own eyes, ears and hands and empowers them to love the earth with wonder, respect and safety. The meadow provides a natural setting for experiential learning and exploration that will foster a lifetime of wonder and appreciation for the natural world. Children enjoy ‘looking up’ to discover the characteristics of trees, birds and woodland creatures. They love running, playing ball and parachute play in our wide open space and take safe risks–climb our small trees, jump over rocks, dig in squishy mud, stomp in puddles. The meadow is enjoyed by our entire family community and is the natural setting for community traditions like our Annual Fall Festival. Children love clambering about the playscape, a landscape designed to maximize instinctive, wholesome play. Like our curriculum, the playscape is thoughtful and deliberate. It provides different ways for children to move their bodies as they move from place to place. The children run vigorously across the flat tracks, hop along from one stepping stump to another and delicately tiptoe along the natural balance beam. The land’s natural slope provides wonderful ways to go up, like the uneven log steps, and wonderful ways to go down, such as the embedded slides. Adding to the variations in the playscape, plantings were selected by a master gardener in our community to further engage the students with a variety of textures, scents, colors, and natural drama throughout the changing seasons. Plus the large sand area, at a depth of 16 inches, accommodates endless industrious digging and construction activity of an entire class, allowing for creativity, imagination and teamwork to develop. 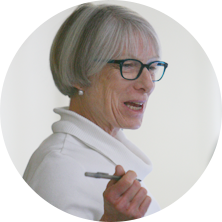 Building on the strong foundations of Quaker and progressive education, Janet has introduced a range of innovations and enhancements to the school’s curriculum and learning environment over the course of her tenure. 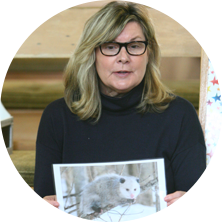 One of Janet’s first accomplishments was to transform school’s traditional playground into a natural playscape where features, such as slides built into a pre-existing slope, encourage children to interact with the natural world. 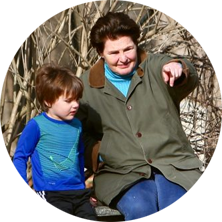 Janet also has launched enrichment programs in sign-language, Spanish and music and movement, and established the two-year-old Chickadee class. Janet began her career in education after having her own children — twin sons and a daughter — and devoting her time to them during their early years. A graduate of William & Mary, Janet worked after college in computer programming and systems design on Wall Street, and when she went back to school for her Masters in Education, her initial focus was on computer education. Before coming to Friends, she created and taught computer classes at Briarcliff Middle School. Janet’s skills and interest in math and science education have inspired more recent CFNS curricular enhancements, including the introduction of the Building Blocks early childhood mathematics program for 4- and 5-year olds, launched after Janet spent two summers studying and training at Bank Street College. Another recent innovation is the Magnet Wall — a three dimensional playspace that allows children to cooperatively explore physics in a hands-on environment. Each day, Janet keeps in mind that “children are in the process of becoming and growing into their potential” during their years at CFNS. “Our daily mission is to empower the teacher within every individual, children and teachers alike.” The school encourages students “to seek truth, to learn in order to serve others, and to take responsibility for one’s own learning.” She adds that “parents are honored guests, integral to our school community, and families and teachers share the children’s journey of growth. Karen Warren traces her interest in early childhood education back to her own experience in Kindergarten. “I had a very difficult time separating from my mother, and sadly, was not supported by a kind Kindergarten teacher. I think this is why later I became determined to help young children adjust to school in a gentle, positive way. Feeling safe, respected and encouraged at school is important to facilitate a love of learning.” A native of upstate New York, with a BA in Elementary Education from SUNY Cortland, Karen came to Friends after relocating to Chappaqua from England, where she substitute taught at the American School in London. She has held a number of positions over the years at CFNS, including head teacher for the Robins. Karen was drawn to “the Friends philosophy of kindness, friendship and appreciation of nature, as well as the school’s child-centered approach to learning through productive play.” One of the things Karen loves most about being a teacher at CFNS is “having the privilege of listening and sharing conversations with young children. It’s a gift to hear their stories.” An active volunteer in the community, Karen serves on the board and is a past president of CAREERS For People With Disabilities. Distraught when it was time for her youngest son to leave CFNS for Kindergarten, Kathy Gonzalez feared her nearly lifelong association with the school was drawing to a close. So the Chappaqua native and CFNS alum was “elated” when school director Janet Himel asked her to join the faculty, first as a substitute and then as a full-time assistant. “Every day at CFNS brings new excitement, new joy, and new challenges,” Kathy says. “When unsolicited hugs come my way, I know those children feel loved and are safe. When a child takes something we have taught one day, such as leaf types, and the next day says ‘Look! 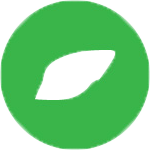 It’s an oak leaf!’ then I know they are excited about learning. When they say ‘I’m sorry’ to a friend, I know we have taught them to be empathetic.” A graduate of Syracuse University who worked in the fashion industry before returning to Chappaqua to raise her family, Kathy also sits on the board of the Steffi Nossen School of Dance and Foundation, where she danced and taught during high school.